Bluestone Apartments in Greenfield, Indiana is NOW available on our website! Bluestone Apartments is a new 208-unit Class “A” luxury apartment community situated on more than twenty-one acres in the city of Greenfield, Indiana, just east of Indianapolis. Construction of Bluestone was completed in 2009 and the community now has occupancy near 100%. Bluestone is the newest market rate apartment community in Greenfield and, simply stated, is clearly the “Best in Market”. The community offers a full amenity package befitting its status as a first class community. The impressive and well-decorated clubhouse includes a state-of-the-art fitness center, cyber café with Wi-Fi, a business center, a theater/Wii lounge with big screen television, and a well-appointed community room with fireplace for resident special occasions. Other community amenities include a swimming pool with sundeck, a gated pet park and two scenic lakes with fountains. Many units offer water views. The property has been professionally landscaped and has excellent curb appeal. The community has thirteen distinct unit types (sixteen when garage options are included), providing choices to virtually any discriminating resident. One bedroom units (in five floor plans) range in size from 779 square feet to as much as 1,117 square feet, including a den. Two bedroom / two bath flats (in seven floor plans) run from 970 to 1,183 square feet. The community offers two bedroom townhomes at 1,105 square feet and three bedroom townhomes at 1,389 square feet, with or without attached garages. All townhomes have two and one-half baths. Every unit has a private entry, gourmet kitchen, washer/dryer hookups, nine-foot ceilings and private patios or balconies. Other unit amenities vary by floor plan and include kitchen pantries, walk-in closets and private storage closets. Select units have attached, direct access garages. Residents of units which do not include direct access garages may rent either attached or detached garages. Major Rehab in 2011 / 2012: The current owner has expended over $3.4 Million for capital improvements in an extensive rehab of the community. 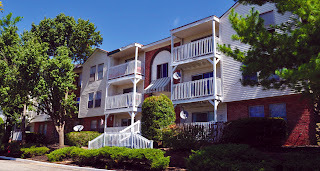 Significant projects include installation of a brand new pool and sundeck, major electrical upgrades, balcony replacements, asphalt resurfacing, replacement of four roofs, and renovation of approximately fifty down units. Outstanding Opportunities to Add Value: Residential rents have been increased several times as property improvements have been completed. Additional value can be created through continuing to upgrade unit interiors. In addition, over 12,000 square feet of commercial space is still available for lease. The seller only recently began seriously marketing of this space, having previously focused on the rehab. In Strong Apartment Market: New Albany, Indiana is located directly across the Ohio River from the city of Louisville. Greater Louisville is a strong apartment market in terms of both rents and occupancies. Increasing Occupancy: Occupancy has steadily climbed since the seller’s acquisition and has averaged 91.3% for the trailing three months through March 2013. Convenient to Downtown Louisville and the Ohio Riverfront: Vibrant downtown Louisville and its many shopping, dining and entertainment options and employment centers are just a fifteen minute drive from the property. Take advantage of this rare opportunity to acquire four properties totaling 698 units located throughout Indiana. The properties may be purchased separately or as a portfolio. Each property has unique strengths and opportunities for additional value creation. All four of the properties are well located in robust rental markets. Offered free and clear of existing debt. Offer Deadline is June 7, 2013.